Our galvanized sign holders have been industry standards for years. These long-lasting, rust-proof products last for decades. These one-piece holders are shipped flat and only take seconds to set up. Just bend the sign leg upright and tilt the sign face. To store, reshape to a flat piece. Select from many face sizes and styles. Excellent for use with our many Billboards, Laser-Printable Stock and Sold signs. Each has a 12” vertical support. Sold in boxes of 25. 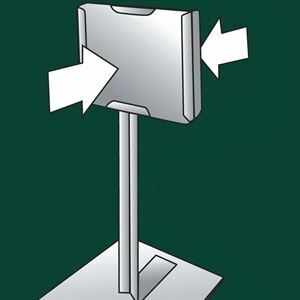 These one-piece tabletop sign holders are convenient for merchandising product on any flat surface. Face is angled for better viewing. Nests for compact storage. 25 per box. 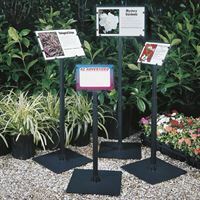 A favorite holder for use at garden centers that use railing or header boards down the center of tables or beds. 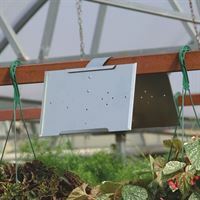 Also perfect for use with hanging basket racks. 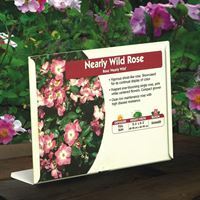 Holds 11 x 7" signs. Sold in boxes of 25.